The following is my inofficial translation of the chapter on kakidi given on the homepage of the Motobu-ryu and published with the kind permission of Motobu Naoki Shihan. Kakede [literally hooked hands] (in Okinawa dialect kakidī) is and old style form of jiyū-kumite, or free sparring. It is also called kake-kumite. In this old style sparring, from the position of crossed arms (see photo at the Motobu-ryu page) techniques are freely applied. In the Ryūkyū Kingdom era, in Shuri-te and Tomari-te (presumably even in old style Naha-te), kakidī had been actively carried out. On rainy days kakidī was practiced while sitting in the room. Motobu Chōki Sensei focused on the training of kakidī, saying ”it leads to obtaining an expert’s eye”. Speaking from today’s standpoint, it seems to mean that it can lead to an improvement of dynamic visual acuity and reflexes. As kakidī is performed from close range, rapid reactions are required. Translators’ note: As for the term kakede or kakete: According to Motobu Naoki Shihan, the Motobu-ryū uses the pronunciation kakede (kakidī). When one pronounces it kakete, today it means hooking block, too. Uechi-ryū practioners often use this term. Following the abolition of the Ryūkyū kingdom and the establishment of Okinawa prefecture, kakidī as a training method declined. The reason for the decline is unknown, but one of the factors may have been that it was considered too dangerous as a form of jiyū-kumite (free sparring) to be adopted into the physical school education of Okinawa Prefecture. Of course, as a general rule when performing kakidī the techniques are stopped shortly prior to the target, which is called sundome and which associates with jiyū-kumite, which means that danger is minimized. In the current Motobu-ryū, besides sundome practice might also be carried out by using protective equipment (bōgu). 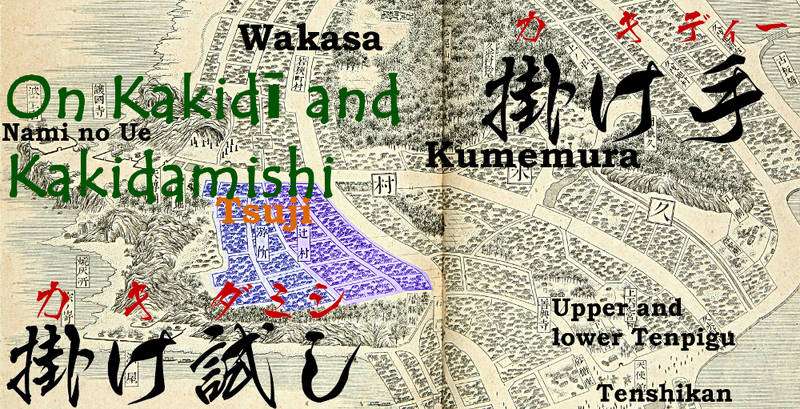 Well, from the Ryūkyū kingdom era to the middle of the Meiji era, in Naha‘s Tsuji district there was a form of actual combat called kakedameshi (kakidamishi in Okinawa dialect).This kakidamishi means a ”contest of kakidī”. That is, kakidamishi had been performed in kakidī style. This etymology, too, currently seems to have been generally forgotten. Kakidamishi has been misunderstood as having been performed in a no-rules ”street fight” manner, but that’s not what it means. Kakidamishi is basically performed in conformity to the specific rules of kakidī, and carried out while considering the safety of each other, and also under the eyes of an observer/witness. By the way, Tsuji (Chīji in Okinawan dialect) is the name of a district of Naha. In mainland Japan during the Edo Period there was the thing called tsuji-giri –i.e. a Samurai randomly killing a passer-by in order to test the sharpness of his sword or to exercise. This Tsuji has the meaning of a road or street with a lot of traffic, a crossroad or street junction. Therefore this Tsuji is different than the district name of Naha Tsuji. From this, the misunderstanding was often spread on the mainland that kakidamishi is ”the tsuji-giri of karate”, with the name Tsuji probably having been the cause for the mix-up of meanings. Certainly there were cases of challenges to sudden fights in kakidamishi, but this was usually the exception and exclusively done with the consent of both parties. Map of Okinawa showing the Tsuji area as of the 1870s. Ichiji Sadaka (1826-1887): Okinawa-shi (The History of Okinawa), 1877. It should be noted that in Naha-te (Gōjū-ryū) of early modern times (since the Meiji Restoration), the training method of kakie has been handed down, which is similar to kakidī. Whether it has the same origin as kakidī or whether it was a new training method handed down from China since the Meiji period is unknown. In the Chinese martial arts there is also a training method of the same type called tuisho (pushing hands). As regards the techniques of kakidī currently handed down in the Motobu-ryū, many of the teachings were bestowed by Marukawa Kenji (1913-2007), who served as an advisor to the Motobu-kai (see photo at the Motobu-ryu page). According to Marukawa Sensei, there is the episode that during the kumite practice with Matsumora Kōsaku Sensei, Chōki Sensei once struck Kōsaku Sensei in the face, and this seems to have happened during the practice of kakidī. This entry was posted in Unknown Ryukyu and tagged kake dameshi, kakedameshi, kakidi, kakie, Matsumora, Motobu Choki, Motobu-ryu, Naha-te, Shuri-te, tomari-te, tsuji. Bookmark the permalink.